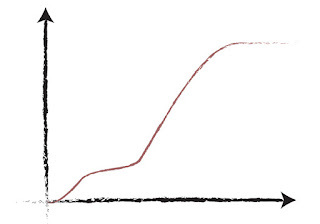 Following the interest in a previous post about analysing growth curves in Matlab I would like to discuss issues in growth curves that can arise from the methodological/biological side of things. Fitting the data is perfect if the data is perfect, if not, looking at what is wrong by eye is warranted for future corrections. 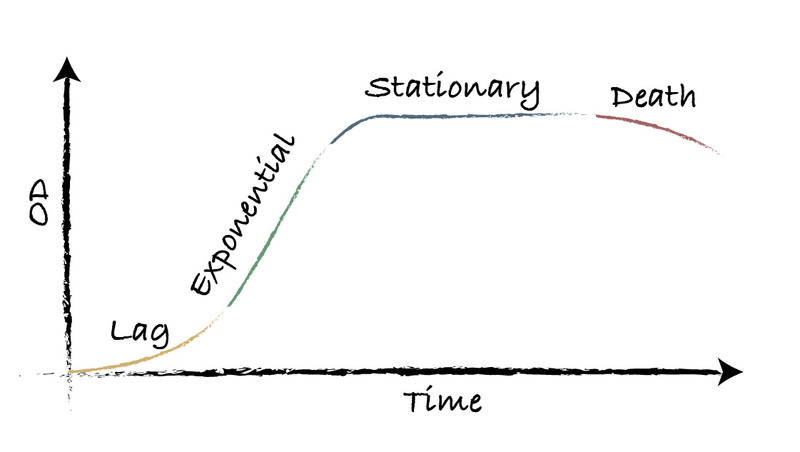 Growth curves can be divided into phases (lag, exponential, stationary and death) and each has its pitfalls. 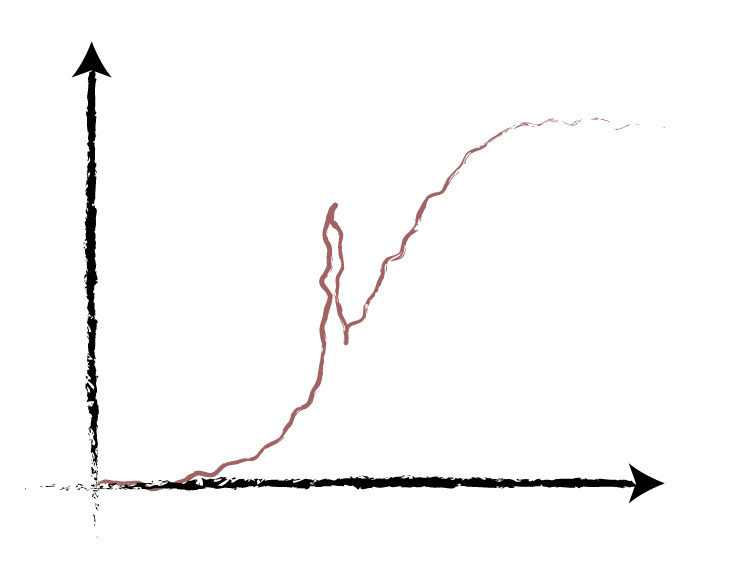 The boundary between the lag and exponential phase is unclear. 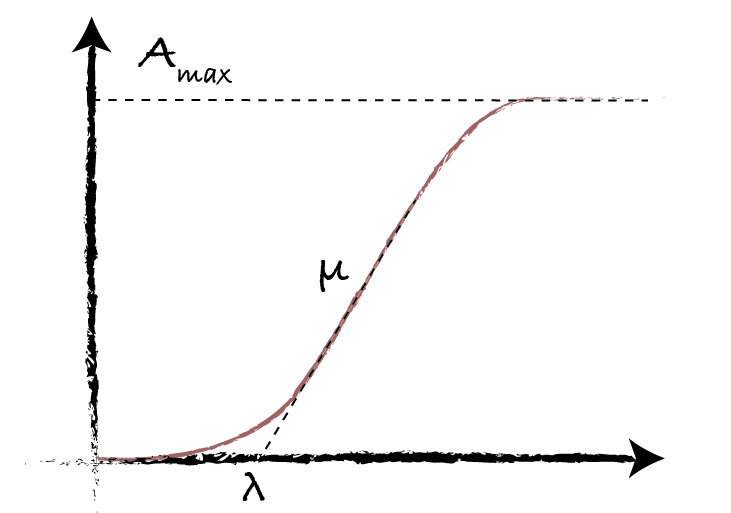 In fact, the unit of measure of exponential phase is the slope µ and the stationary phase is the maximum absorbance, which are straight forward. For the lag phase a plethora of units are used, such as time to a given OD. I use the intercept of the slope on the time axis as the equation I use has that as a parameter. The cells in the wells have to come from somewhere and the most common and correct place is a starter culture. 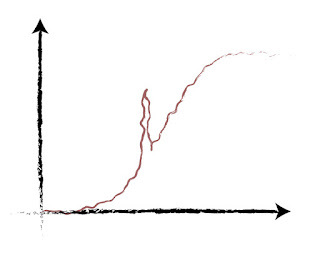 However, if the cells in the starter culture have not reached stationary phase the culture will be a straight line from when the OD beats detection —generally 0.01 AU is used as a starting point and the cells cannot be really detected at that point by OD at 600 nm, unless they carry a fluorescent protein in which case they can and if it is a sensor some interesting things are seen in those first few minutes (decrease generally). 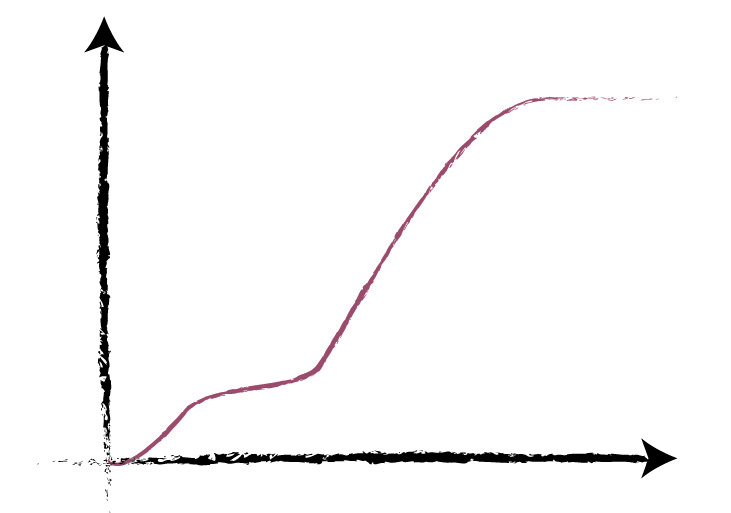 If the cells are bradytrophic for a given compound or some similar experiment, they ought to be washed at least twice beforehand or the curve will show a step in the lag phase as pictured below —in some cases it is rather hard to get rid of and the some cure is to leave the cells to starve a bit. 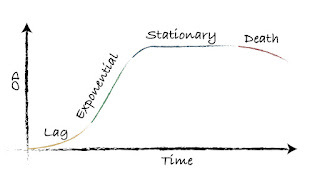 The exponential phase is when a straight slope is seen which represents the increase in absorbance over time. The line is sometimes not straight however. 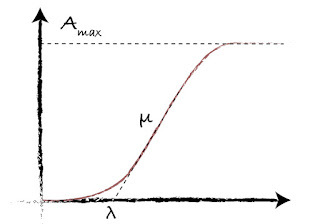 If a really slow approach to stationary phase is seen, the curve is biphasic and is the result of a substrate being depleted and a switch to a suboptimal one is seen. Growth curves in LB are a bad idea due to this. There is not much glucose in LB —the content is 1% protein shake and 0.5% marmite. Growth is mainly on alanine, which is racemised and oxidised into pyruvate. Aspartate and glutamate are not as preferred and curiously E. coli lacks branched chain amino acid decarboxylase. Therefore, a defined medium with glucose is best (M9 with 0.4% Glc or MOPS with 1% Glc and 0.4% AAs). The opposite, the breaking of a burdensome plasmid might be visible, but I have never really seen it black and white. 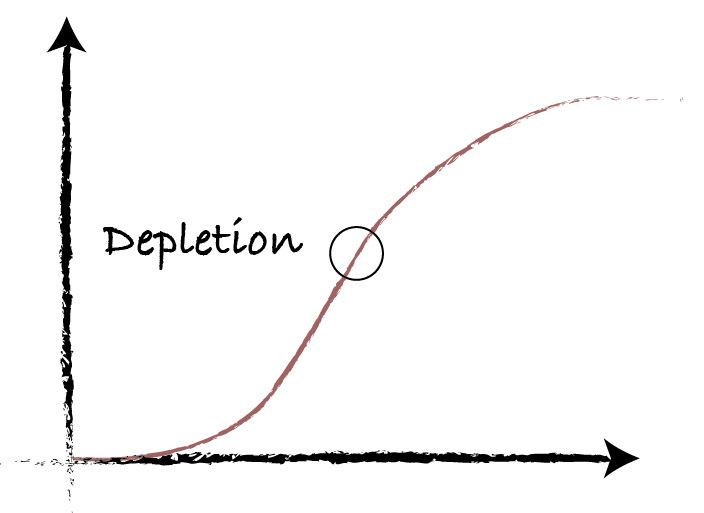 I made the mistake of trying to model death phase into the logistic equation. It was a mistake as it was not an actually death phase. And I have seen different fake death phases again and again. 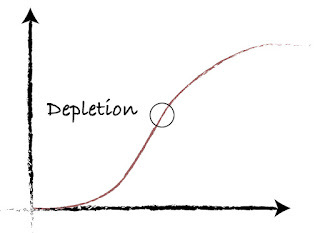 Decrease in OD can result from evaporation: 100 µl in a well is just enough for good aeration with a breathe-seal —GFP maturation needs oxygen...—, but after 24 hours it will be somewhat halved and the OD seems to drop. In short, if your cells have been washed well, don't have a strange genotype, don't clump and are correctly fed they will look like picture perfect cells.